New York medical malpractice lawyer David Perecman considers an infertility clinic's mistake in Ohio. A doctor had given Carolyn Savage the wrong embryo and she became pregnant with Paul and Shannon Morell's child. The Savages say the fertility clinic transferred the wrong frozen embryo to Carolyn's womb in early February. Ten days later, Sean Savage got a call from a doctor saying his wife was pregnant with someone else's child. Due to her religious beliefs, Carolyn decided to carry the baby to term knowing that she would have to give the baby up once it was born. According to the New York Post, the accident was caused by human error at the lab. New York medical malpractice lawyers know that damages in such cases are extreme. "It's hard to pre-determine what the loss, grief and emotional damage this would cause in New York," said medical malpractice lawyer David Perecman. For the past 30 years, the New York medical malpractice lawyers, personal injury, construction accident, and auto accident lawyers at The Perecman Firm, PLLC have championed all types of cases for victims of auto accidents and their families. David Perecman, founder of the Firm, is a Board Director and the past Secretary and Treasurer of the New York State Trial Lawyers Association (NYSTLA) and a chair of its Labor Law Committee. 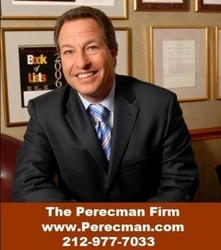 Mr. Perecman's achievements have brought him recognition as an Honoree in the National Law Journal's Hall of Fame, in New York Magazine's "The Best Lawyers in America" and The New York Times Magazine "New York Super Lawyers, Metro Edition" for the years 2007-2010. $40 million dollar structured settlement for medical malpractice.